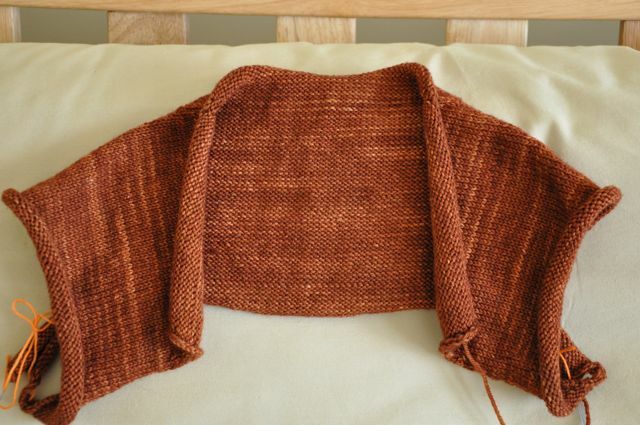 I’m working on a Dew Point shrug (pattern by Laura Chau, Ravelry link) using madelinetosh Tosh DK yarn in a colour called Violin. The pattern is interesting. You take a measurement, then fill in the blanks through the rest of the pattern from a table, so that you only have the numbers for your size in front of you. I like this way of doing patterns. My measurement falls between sizes, so I’m making the smaller one and I started with a purl row because my row gauge was slightly off and it makes the first raglan increase row easier. In only a few days of knitting I was at the point where you separate sleeves and back, stocking stitch in sportweight yarn grows like a weed. I’m liking the yarn a lot, I could see making sweaters and cardigans out of this. It is slightly splitty, but I’m using a pointy lace circular needle which could well be the problem. I upsized the arm circumference by adding extra increases in the final knit row before separating the sleeves and back. Punching drills at karate have given me enough muscle definition to make skinny sleeves uncomfortable. I’m a little afraid of picking up all those stitches for the chain lace part, but that comes later. I got the yarn from, Eat.Sleep.Knit, who emphasise that only their photos are true colour representations of the yarn, re-done when they get yarn in that looks different to the photo, and more representative than even photos from the manufacturer. I picked this colour because their photo showed a warm orange brown. But when my yarn arrived, it was significantly darker than the website photo. I pointed this out to the store and they said they were sorry I was disappointed but it was my monitor that was at fault, and I should remember for future orders that my monitor is showing their photos wrong. I’ve never had this problem when ordering from any other online yarn store. Their photo looks the same on the two other monitors I tried (two windows machines, plus my Mac laptop), and also on the monitors of three friends in different states. I will not be buying from Eat.Sleep.Knit again and I cannot recommend their photos for accuracy of colour. Good luck with the picking-up! Though it looks like it will be worth it – cute shrug! This, exactly. How on earth can they make that outlandish claim? But that being said, I do think that the yarn is a pretty color! Oh goodness. I’ve never once heard that type of nonesense from any yarn source about color! Nevertheless, it does look like a comfy knit.